For over one hundred years, the name Conn has meant the very finest in American-made saxophones. The legendary models of the earlier part of the twentieth century are among the most prized and sought after among collectors and performers alike. 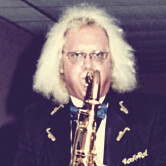 As a tribute to the quality of construction and design, vintage Conn saxophones are often seen today in the hands of top professionals as the “instrument of choice”, and many of the innovations first pioneered by the Conn company are found on instruments produced today by manufacturers around the world. The very first saxophone built in the United States was built at the Conn plant in Elkhart, Indiana, in 1889 for E. A. Lefebre, a saxophone virtuoso who had risen to international fame as a soloist with the famous Sousa and Gilmore bands of that era. Mr. Lefebre was also a personal friend of none other than Adolphe Sax, the inventor of the saxophone, and had previously used instruments supplied to him by Sax himself. The original Conn saxophone was actually constructed by Ferdinand “Gus” Buescher, who was foreman at the Conn factory and who was employed by Conn from 1875 until 1895, at which time he established an instrument manufacturing company bearing his name. The instrument that Buescher built for Lefebre was essentially a copy of an Adolphe Sax horn, and Lefebre was eventually persuaded to join the Conn company, where he was employed in the saxophone department from 1895 until 1906. Conn exhibited alto and tenor models at the 1893 World’s Columbia Exhibition under the model name “Wonder”, and in 1894 advertised a line of “Improved System” saxophones which included straight soprano, alto, tenor, and baritone models. These instruments were available in silver plate with gold plated keys; nickel plate; and polished brass. C. G. Conn, the founder and owner of the company, was elected to the United States Congress in 1892, and introduced a bill which required that every United States Army regiment have its own band, and specified the instrumentation for the musical unit. As a result, military orders for Conn instruments boomed, and in May, 1900, 150 Conn “Wonder” saxophones were delivered to the Army, and were received at the Schuylkill Arsenal by Louis Seel. During this era, Conn began trade-marking names that designated various models. These included Wonder (February 1, 1891); New Wonder (May 1, 1917); Pan American (January 29, 1918); American First (February 5, 1918); C. G. Conn (April 2, 1918); and Victor New Wonder (October 15, 1918). In 1911, Conn advertised a family of saxophones that included a curved soprano (which replaced the previous straight model); a C Melody; and a bass, in addition to the standard alto, tenor, and baritone models. The ad mentioned an automatic octave key (actually introduced some time earlier) and a forked E flat mechanism. Only the alto and tenor models were keyed to high F, the rest of the line was limited to high E flat. A 1915 advertisement references an “improved” octave mechanism; a front F key; a G sharp trill key; a lengthened G sharp key, and a revised arrangement of the left hand pinky table. The 1915 horns were referred to as “New Invention” models, and were awarded the Medal of Honor; a gold medal; a silver medal; and a bronze medal at the Panama-Pacific Exhibition held in San Francisco. In an effort to increase international sales during this period, Conn offered saxophones in both Low Pitch (A=440), and in High Pitch (A=457). By 1916, Conn was advertising that “the saxophone department has been quadrupled in size”, and the 1918 catalog references the introduction of a straight soprano in E flat and a straight soprano in C. This catalog also makes mention of the Conn Microtuner and the Conn Resopad, both hailed as significant advances. These horns are referred to by Conn as “New Wonder” models, Conn saxophones of this era were seen with both soldered and drawn tone holes. The drawn tone holes are referenced by a patent engraved on the body tube (1,119,954 December 8, 1914) which was actually held by William S. Haynes, the flutemaker, and licensed to Conn. Rolled tone holes were introduced around 1920, although straight tone holes were often found for a few more years. The 1922 catalog saw the re-introduction of the straight B flat soprano and the Conn Vacuum pad, which was designed to be installed without adhesives. The straight neck C Melody also made its debut in this year. During this period, Conn saxophones were often seen with spectacular engravings, and considerable experimentation was carried out in manufacturing techniques and design improvements. Conn was unique among American manufacturers in that a full time laboratory with a staff of six was maintained to pursue design improvements. The Conn design laboratory employed several designers, principally Allen Loomis; Hugh Loney; Paul Hardy; Russell Kerr; Edward Gulick; and Leland Greenleaf. The legendary Santy Runyon also consulted with Conn on design matters. Loomis was known for his innovative, often bizzare, designs, many of which were never considered practical enough to enter production. Gulick might best be remembered for his design of the locking pivot screw, a device which has frustrated repairmen for years. Conn saxophones in the late 1920’s were essentially an evolution of the earlier models. There were, of course, improvements in keywork (the cross-hatched G sharp key of 1925, for example), and a redesigned straight soprano in 1928. The Conn instruments were considered the standard of excellence of the period, and a total redesign was not needed. Custom engraving and various finishes were offered, and these are among the most beautiful saxophones ever constructed. A surprising lapse of judgment was exhibited by Conn in 1928, with the introduction of the F Mezzo Soprano. Although the instrument had several unique features (left mounted bell keys, for example), there was simply no demand for a saxophone keyed in F, and the vast majority of these instruments went unsold. Many, in fact, were later used in the Conn Repair School to train technicians. The F Mezzo was quickly followed by the Conn-O-Sax, also keyed in F, but with an extended range from written low A to high G. This strange instrument was quickly rejected in the marketplace, and both it and the F Mezzo were no longer offered by the factory after 1930. In 1931, a new alto was introduced which set the saxophone world on its ear! The totally new design carried over some of the great features of the past such as rolled tone holes; Resopads; Microtuners; and adjustable pivot screws; and added an entirely new mechanism which was far superior to anything seen before. The neck gained a tenon skirt to assist in sealing and aid in the elimination of the “buzzy A”; the octave key was moved to the underside of the neck to protect it from damage; the low C sharp, B, and B flat keys now opened the G sharp pad; and the high E key gained a curve. A swivel thumbrest was added and most keys were repositioned to give the most direct mechanical action. Most, but not all, of these features soon found their way to the tenor. The line continued to evolve, and the baritone and bass models were soon offered keyed to high F.
Conn raised the bar again in 1938 with the introduction of the Connqueror seies alto and tenor. These instruments used the wonderfully complex but efficient Permadjust action, developed by Hugh Loney. This system solved the age old problem of cork compression and key height adjustment. The left hand pinky table was moved to a more comfortable position, and the mechanism was much improved. Key touches were inlaid with silver, and special engraving was added. These are perhaps the greatest of the Conn saxophones. Following World War II, Conn again established itself as the leader in innovation with the Santy Runyon designed Connstellation alto. This instrument used three octave pips to even intonation and voicing; a unique mechanism unsurpassed to this day for lightness and precision; ergonomic placement of the keywork; and an ill conceived plastic keyguard. While not a success in the marketplace, the Connstellation is still highly regarded by saxophone designers and collectors. Conn put greater emphasis on student line instruments to take advantage of the post World War II baby boom market, and paid less attention to the professional market which was increasingly dominated by other makers from outside the United States. 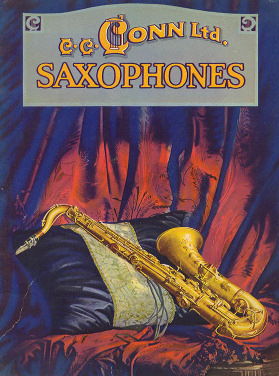 The saxophones lost their rolled tone holes in 1948; and their Microtuners in 1954. The professional models gained nickel plated keywork in 1955, along with clear lacquer. The tenor neck was changed significantly in the late 1950’s to an underslung design, but by then it was too late. In 1960, Conn acquired the Best Manufacturing Company of Nogales, Arizona, and moved most saxophone production there, although the “artist” models continued to be produced in Elkhart. The company has undergone several changes in ownership, and discontinued professional models in 1970.